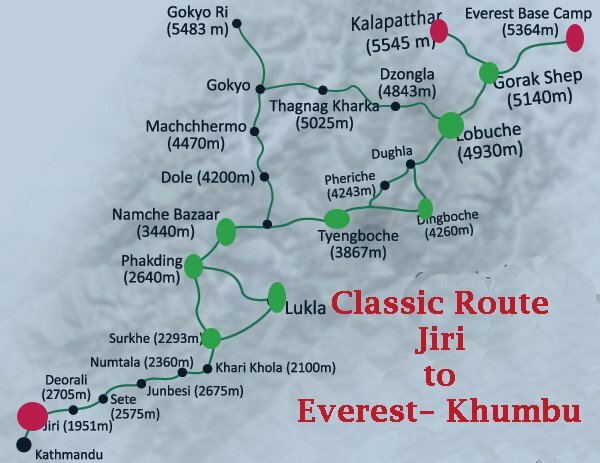 Jiri to Everest Base Camp trek is one of the famous and classic trekking trails to reach Mt. Everest (8848m). 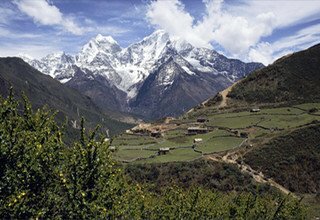 The Jiri to Everest Base Camp trek rewards you with adventure as well as pristine Himalayan scenery. 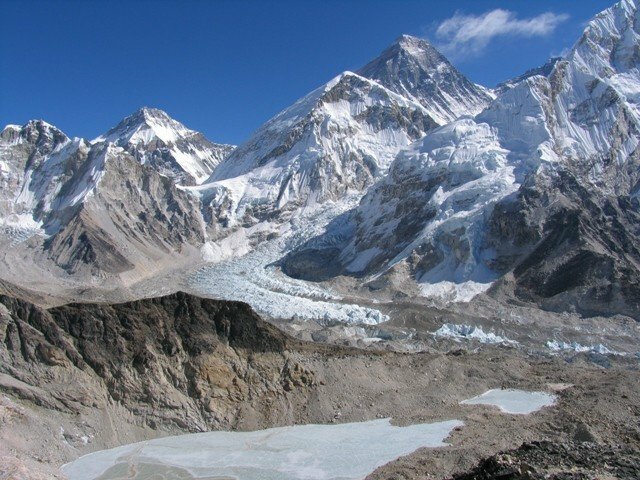 This area is mostly inhabited by the Sherpas, and the major highlights of this trek are the alpine forests, ice-cold rivers, astonishing rhododendron and pine forests, magnificent mountains, high passes, mountain villages, attractive monasteries, and friendly local people. 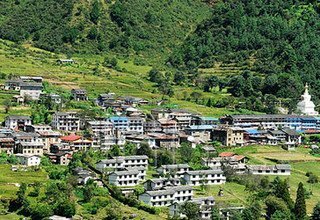 The trail starts from Jiri and ends in Lukla and passes through many exciting and amusing villages that are now visited by trekkers each year. While on the trek, we move through alpine jungles and glacial streams while enjoying the warm hospitality of ethnic people. The trail leads us through many villages of different cultural groups. Some of them are Tamang, Jerel, Rai, Brahmin, Chhetri, and mostly the Sherpas. 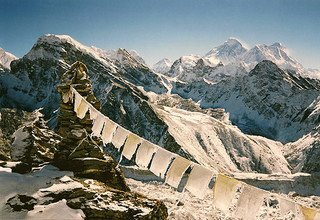 While visiting the Buddhist monasteries/nunneries adorned with prayer flags, we can get a glimpse of Buddhism in the Himalayas. 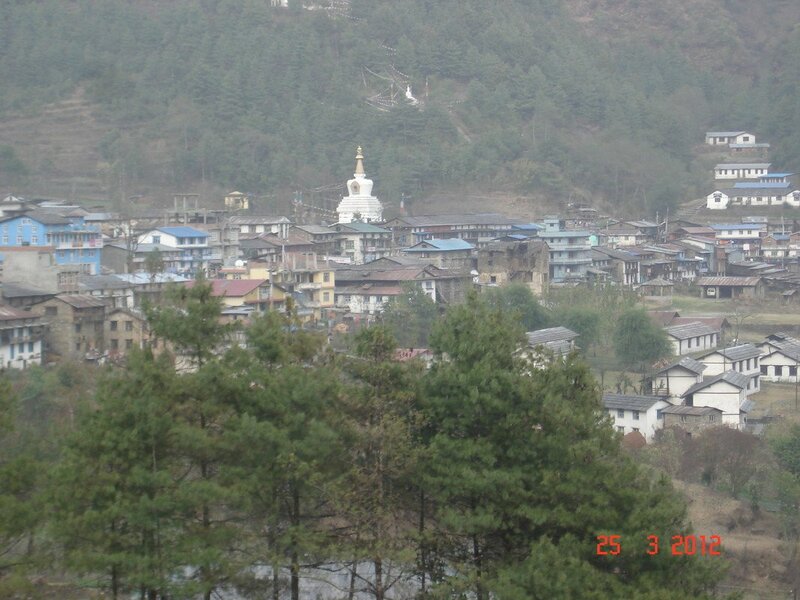 The trail also reaches the most sacred monastery of the region, Tengboche Monastery. 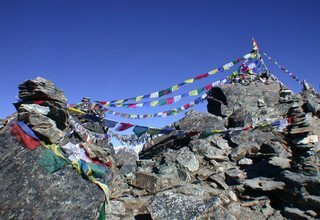 The trail goes through high passes including Deurali Pass (2705m), Lamjura-La Pass (3530m), and Thaksindo-La Pass (3071m). Some of the peaks that can be viewed during this trek are Everest (8848m), Cho Oyo (8201m), Lhotse (8516m), Makalu (8481m), Ama Dablam (6856m), Thamserku (6623m) and many other surrounding peaks. 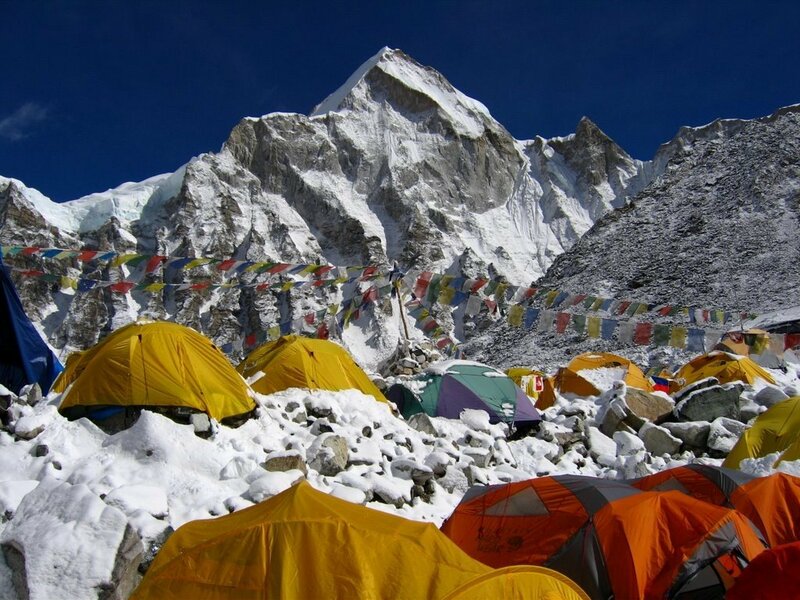 You will also have the opportunity to have a close look at the remarkable Khumbu Icefall from Everest Base Camp. 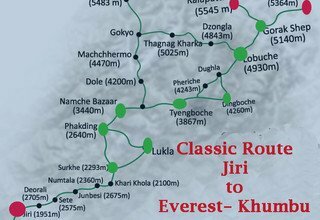 Jiri to Everest Base Camp Trek is a great exploration and audacious trek for physically fit people, who are strong-minded to test themselves within the changeability of mountain life. With our experienced guides and porters, we always make sure to keep you completely safe and create wonderful memories of the mountains. We can custom design your itinerary depending on your preferences and requirements. 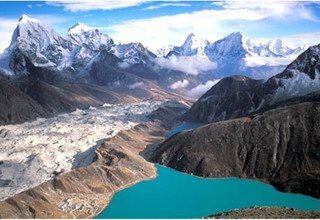 well-maintained trails and comfortable lodges, but the trekking routes here start higher and stay higher and high glacial Gokyo Lake. After breakfast, we will go on a sightseeing tour of the UNESCO World Heritage Sites in Kathmandu Valley. 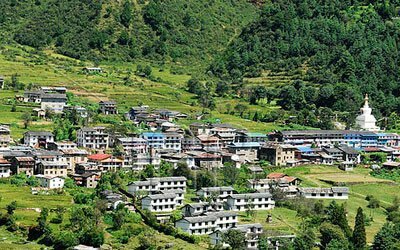 We will visit the Durbar Square, Boudhanath Stupa, Swayambhunath, and Pashupatinath temple, each of them carrying a distinct architectural and cultural significance. Stay overnight at hotel in Kathmandu. Early morning drive from Kathmandu to Shivalaya, we pass by Sunkoshi River while enjoying amazing views of Langtang and Ganesh Himal ranges. We have a short stop at Mude for lunch. We then continue to drive on the country road to reach Jiri. 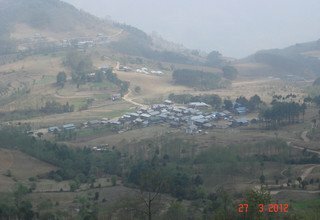 We start trekking immediately after reaching Jiri. 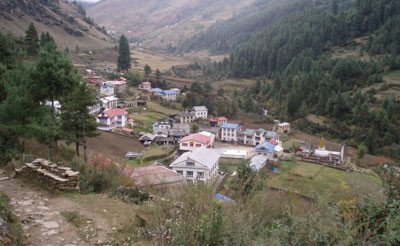 After a few ascents and descents through Sherpa villages, we reach Shivalaya. Overnight at a lodge. 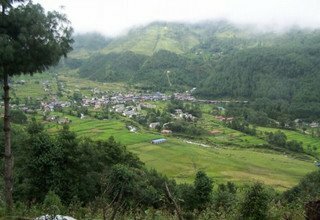 After breakfast, we move on a trail that is steep and goes uphill through the forests to reach Deurali Pass (2730m). Crossing the pass, we descend till we reach the village named Bhandar. After a short stop in Bhandar, we keep moving downhill along the river until we reach Kinja village. Overnight at a lodge. The trail goes mostly uphill from Kinja to Lamjura La (3530m). 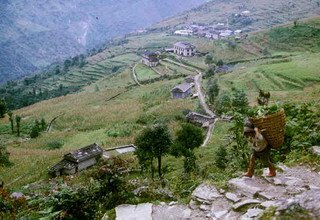 In the morning, we ascend on a sharp hill passing several tea houses and through the forested hill until we reach Sete village. Then the track turns challenging till we cross Lamjura La Pass. Overnight at a lodge. Today, we descend through Rhododendron forests and trek down along the countryside. Descending down the ridge, we soon enter Junbesi, a beautiful Sherpa village. We will pay a quick visit to the Buddhist monasteries of Junbesi. Then, crossing Mani walls and bridges, we climb down on stone steps to reach Ringmu. 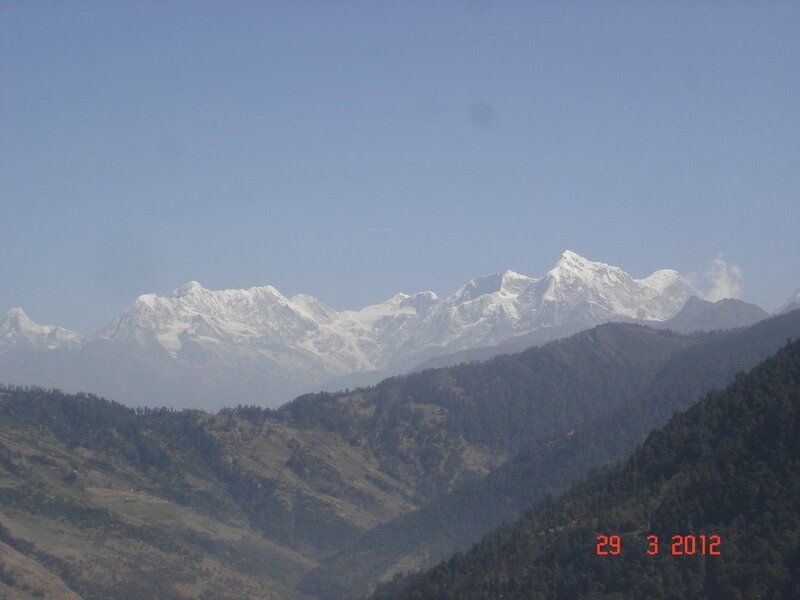 Ringmu is a small Sherpa village which hosts a stunning view of Numbur Himal (6958m). Overnight at a lodge. In the morning, trek through thick forests on a steep trail until reaching Takshindo La Pass (2960m). 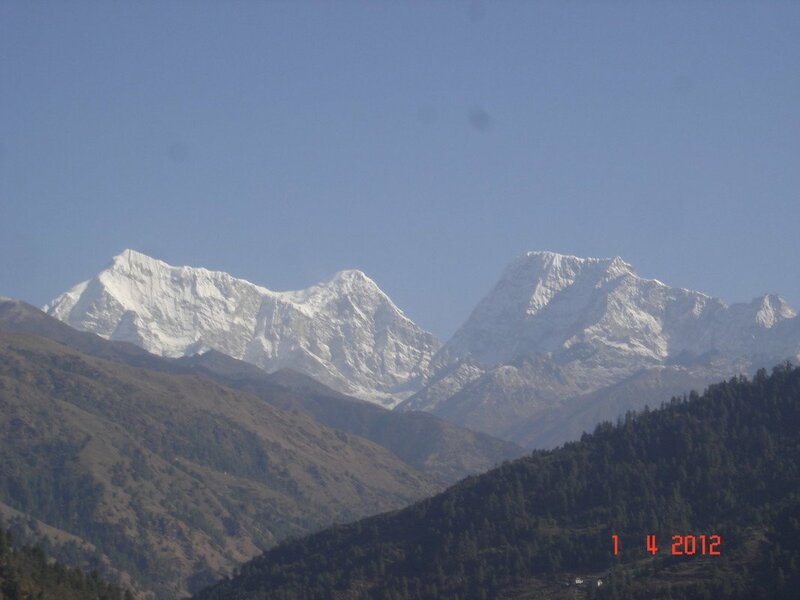 Takshindo La offers a panoramic view of Numbur Himal (60958m) along with other snow-capped peaks. 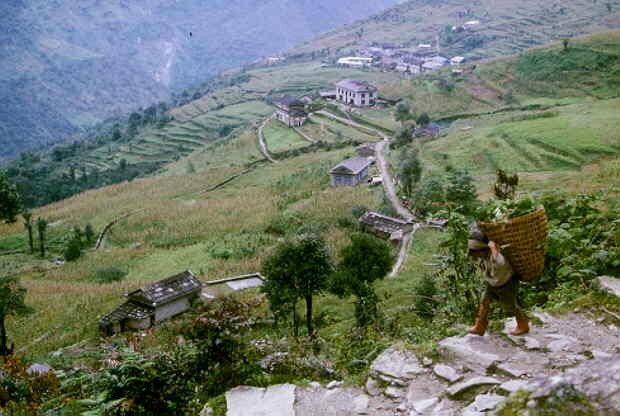 Then, the trail descends through jungles until Jubing and again continues slowly uphill until Kharikhola village. In the evening, we will visit the monastery situated on the top of the hill. Overnight at a lodge. We cross a suspension bridge and continue climbing uphill until we reach Bupsa. Trekking through the forests, we cross Khari-La Pass (3145m) to reach Paiya. We descend further to reach Surke. Overnight at a lodge. We cross Surke Khola and continue walking alongside Dudh Koshi River, en route to Phakding. Walking past a Mani wall and crossing Chheplung Khola, we reach Chheplun, Thado Koshigaon, and Nurning, where we get an amazing view of Kusum Khangkaru (6367m). Then, we walk on a serene trail filled with prayer flags, prayer wheels, and painted Mani walls to reach Phakding. Overnight at a hotel. After breakfast, we trek through rhododendron and magnolia forest with an amazing view of the mountains on the background until we reach Monjo. Crossing a suspension brige over Dudh Koshi River in Jorsalle, we now enter Sagarmatha National Park. 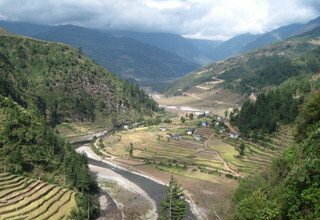 We reach the confluence of Bhote Koshi River and Imja Khola at Larja Dobhan, from where we continue on an uphill trail to reach Nanmche Bazaar. 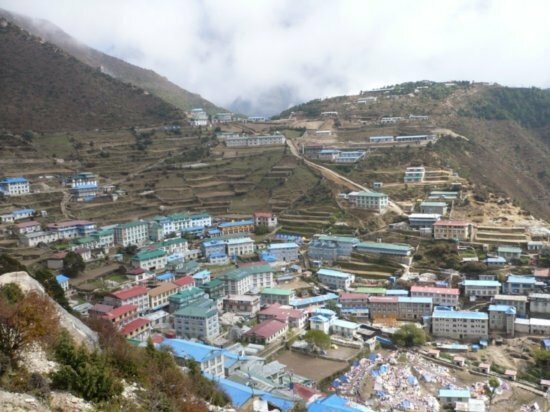 From the Sherpa town of Namche Bazaar, we will have a stunning panorama of Mt Everest (8848m) along with several other peaks of the Khumbu Region. Overnight in Lodge. Today, we will hike up to Everest View Hotel for an excellent view of Mt Everest (8848m) along with other snow-capped mountains. 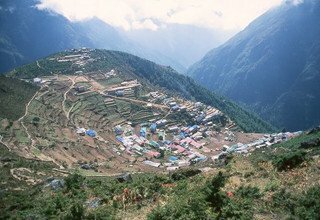 Enjoying the splendid view of the mountains, we then descend to the largest Sherpa village of the entire region, Khumjung. 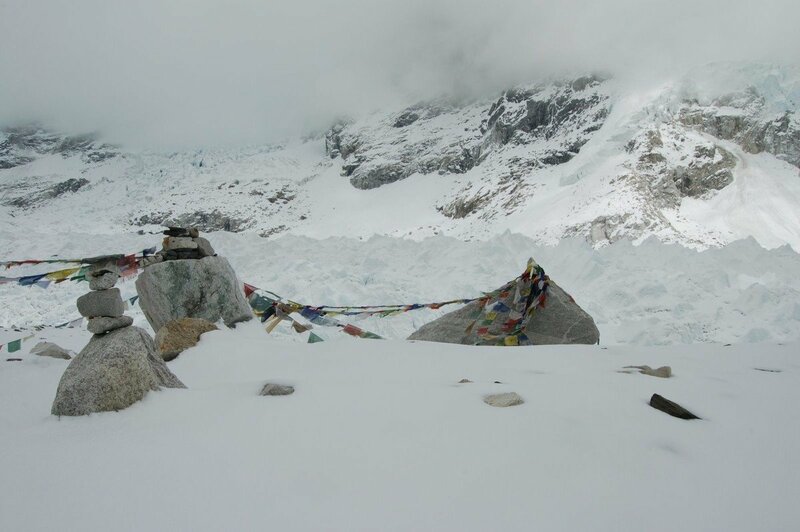 Upon visiting Khumjung Gompa, we can have a look of a Yeti's skull that is kept safely inside the monastery. 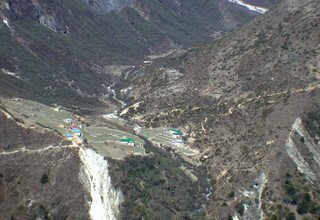 We will then ascend to Khunde and then descend to Namche via Syangboche. Overnight in Lodge. Walking alongside Imja Khola, we cross a big stupa on our way to Kyangjuma village. Continuing on our walk uphill we can see prayer wheels driven by water right before we arrive in Phunke Tenga. 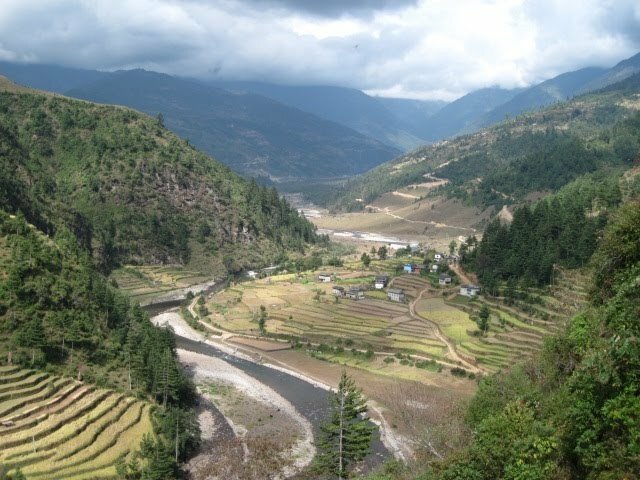 Then, we follow the Imja River uphill on a sharp ascend to reach Tengboche village. 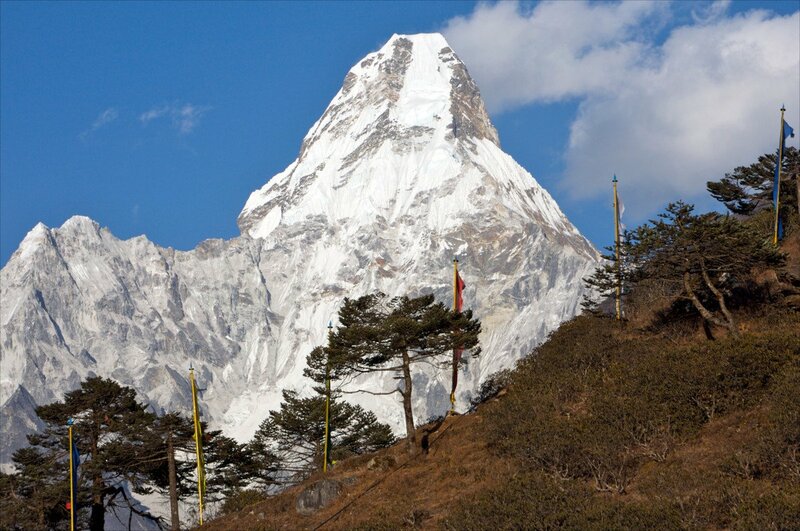 We will visit the famous Tengboche Monastery and enjoy an amazing view of Ama Dablam (6856m), Kangtega (6782m), and Thamserku (6623m), and Taboche Peak (6542m) among other. Overnight in Lodge. 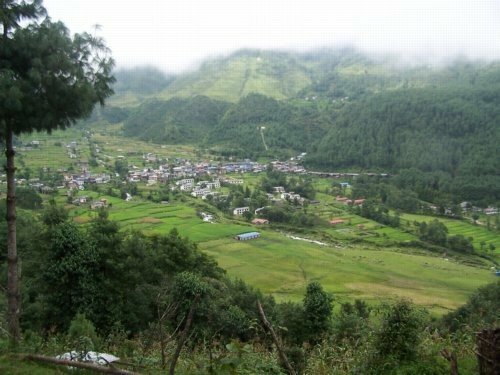 The trail goes downhill through the rhododendron forests towards Deboche village. 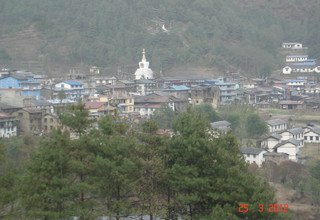 Passing by several monasteries and Pangboche village, we arrive in Somare. Crossing several bridges and stone walls whilst walking alongside Imja Khola, we reach Dingboche. 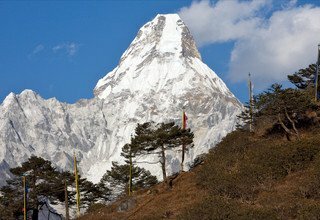 Enjoy the views of Ama Dablam (6856m), Island Peak (6189m), Lhotse (8516m), Taboche (6542m), Lobuche (6119m) and other peaks. Overnight in Lodge. Today we have a day off to acclimatize. 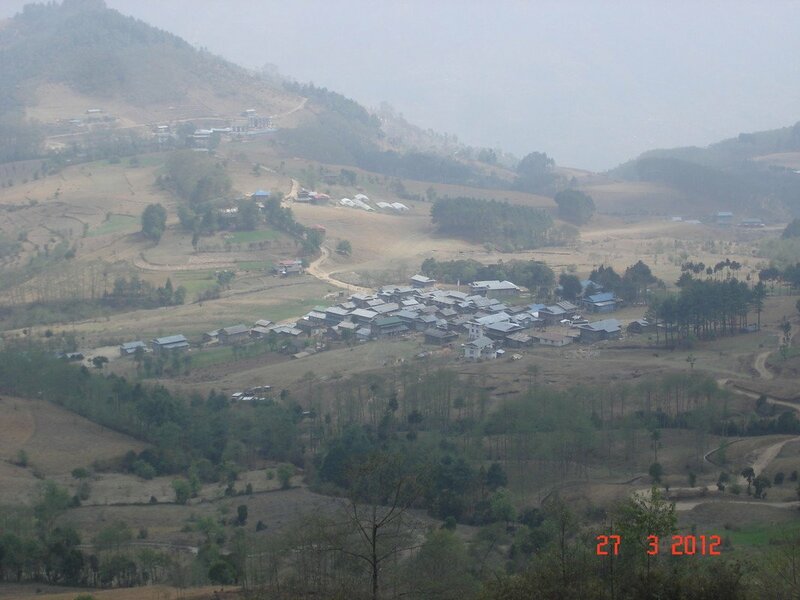 So, we cross a yak grazing land to reach Chhukhung village. 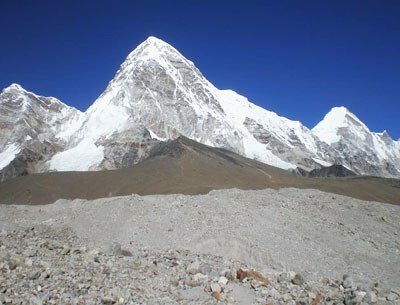 Then, we continue walking on steep trail uphill towards Chhukhung-Ri (5550m) to have a close view of Lhotse (8516m), Makalu (8481m), Island Peak (6189m), and Baruntse (7129m) as well. 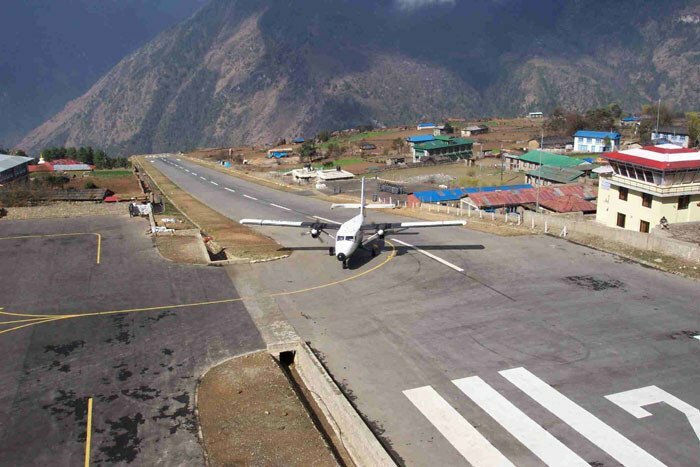 We then descend to Chhukhung, and then to Dingboche. Overnight in Lodge. Walking alongside a glacial river, we pass through SHerpa settlements of Dusa and Thukla before crossing Thokla Pass (4830m). 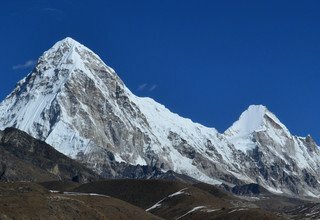 Along the way, we will have stunning views of the majestic peaks like Pumori (7161m), Nuptse (7861m), Lobuche (6145m), Cholatse (6440m), Taboche (6542m), Ama Dablam (6856m) and other surrounding peaks. 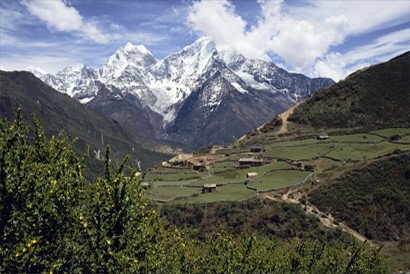 Walking on a steep trail on the moraines of Khumbu Glacier, we reach Lobuche. Overnight in Lodge. 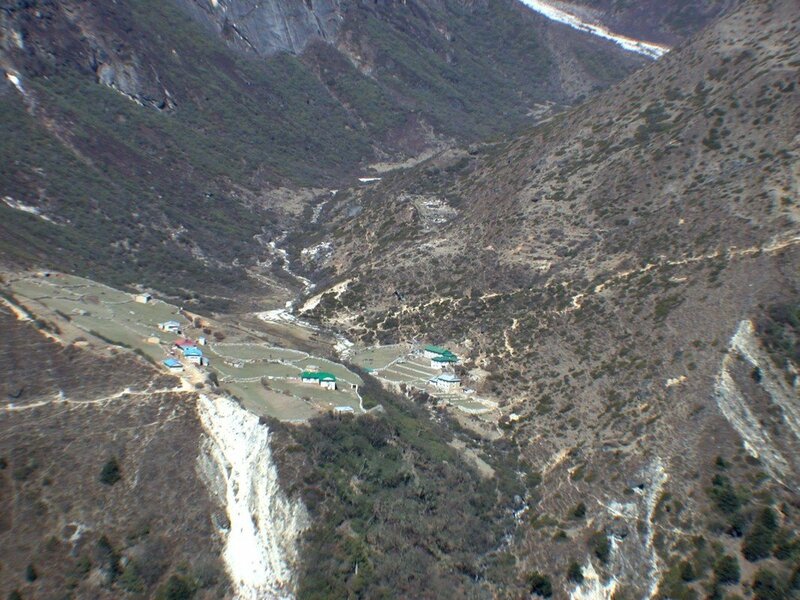 Continuing our trek on the bank of Khumbu glacier, we pass Lobuche glacier and ascend towards Changri glacier. The trail is steep and icy, so we need to be careful while ascending. Walking on the Khumbu glacier, we reach Gorakshep and continue trekking on the moraines to reach Everest Base Camp. Standing below the giant Mt. 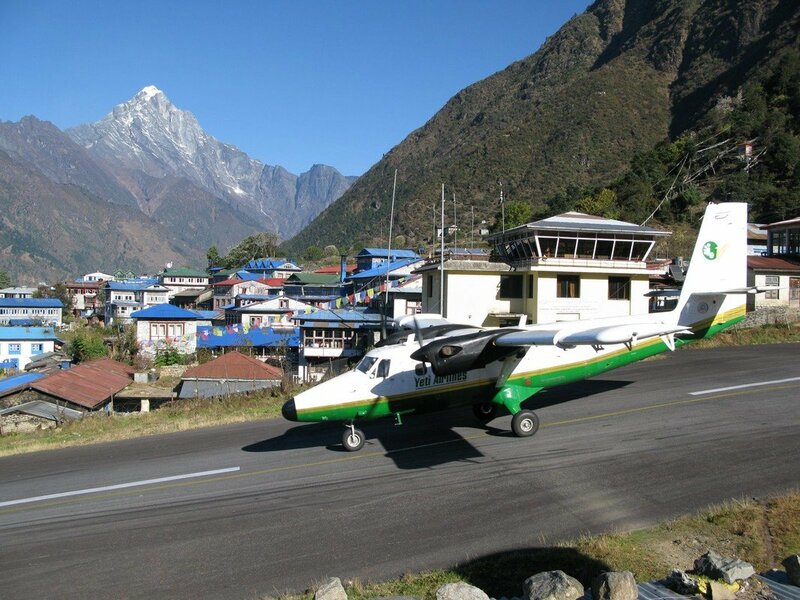 Everest (8848m), we can have a breath-taking view of the widespread mountains of the Khumbu region. After spending some time at the base camp, we head back to Gorakshep. Overnight in Lodge. Early morning, we will hike up to the best view point of Everest, Kalapatthar (5545m). The trail goes sharply uphill and may need strenuous effort to reach Kalapatthar. However, the sunrise view of the mountains, mainly Mt. 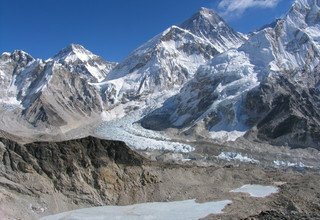 Everest (8848m), is worth going on a strenuous trek for. 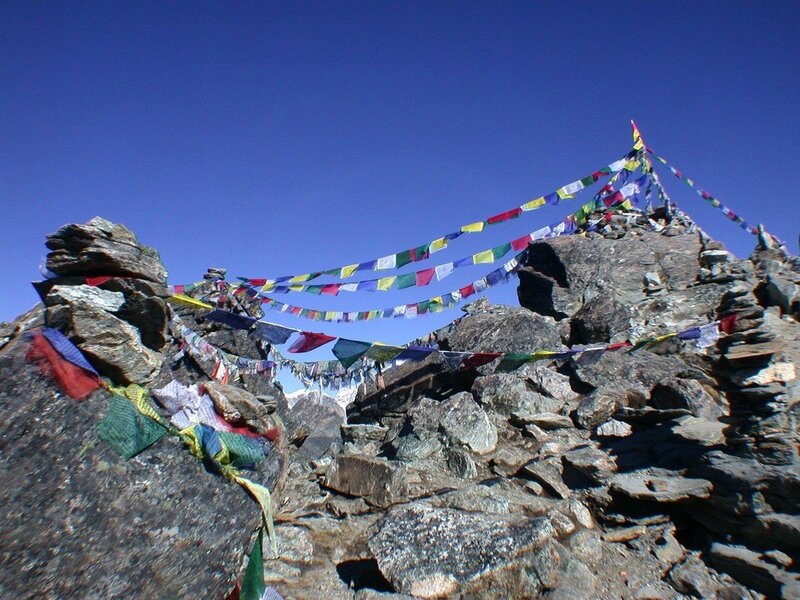 After some time, we head down to Gorakshep and retrace our trail to Thulka via Lobuche. Overnight in Lodge. The trail starts with a gradual climb which then turns sharp to reach the top of Cho-La Pass (5420m), one of the three high passes of Khumbu region. 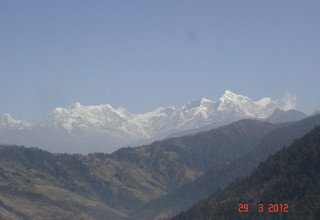 Enjoy the amazing views of the snow-capped mountains. Afterward, descend to Thangnak after a difficult icy crossing on a slippery path. Overnight in Lodge. The trail moves up and down by crossing Ngozumpa glacier, the largest glacier of Nepal, to reach the beautiful Gokyo valley. An amazing close-up view of Cho-Oyu (8201m) and other adjacent peas can be observed throughout the way. After a tough walking through the Ngozumpa glacier, we arrive at the third Gokyo Lake and spend some time enjoying the tranquility of the place. We then enter Gokyo village to have a good rest amid the mountains. Overnight in Lodge. Early morning, we trek to Gokyo-Ri at 5360m. 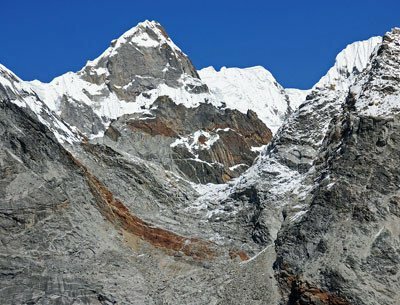 Ascending on a steep trail, we reach Gokyo Ri to view a mind-blowing panorama of Mt. 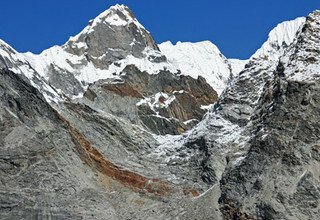 Everest (8848m), Nuptse (7861m), Makalu (8481m), Lhotse (8516m), Cho Oyu (8201m), Pumori, Ama Dablam (6856m) and other peaks during the sunrise. 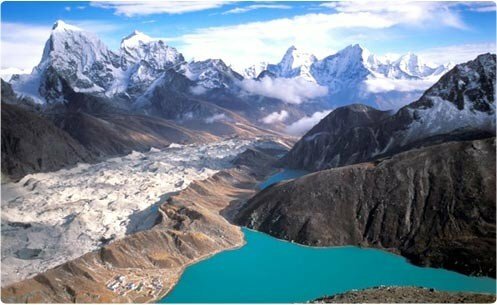 We then climb down to Gokyo, come across two Gokyo lakes, and then follow Dudh Koshi River downstream to arrive in Dhole. Overnight in Lodge. 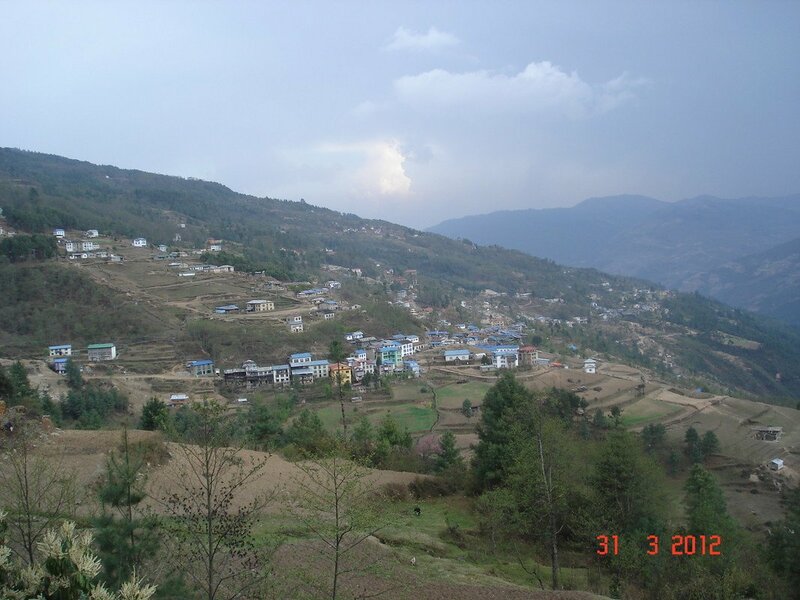 Descend to the track that leads us to Phortse Thanga. Then, the trail goes sharply uphill until we reach Mongla. 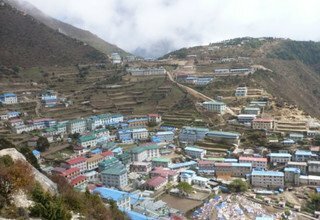 We continue going downhill to reach Kyangjuma from where we cross the Tenzing Norgay Memorial Stupa to finally arrive in Namche Bazaar. Overnight in Lodge. 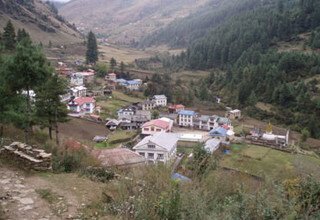 Leave Namche Bazar and descend through pine forest. Cross the suspension bridge over the Dudh Koshi River. Then, our trail continues by the riverside till Jorsalle. We continue walking to Phakding by passing several bridges. Stop for lunch and then continue until Lukla. Overnight in Lodge. Day 23: Fly from Lukla to Kathmandu and transfer to Hotel. 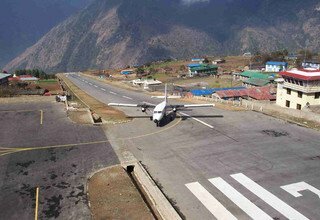 We take a flight back from Lukla to Kathmandu early in the morning, which takes about 45 minutes. On arrival, transfer to hotel. Refresh and relax. Stroll on the streets of Thamel. Overnight in Hotel. After breakfast, we shall drop you at the airport before the scheduled time. Farewell, and we hope to see you again! * 3 nights deluxe accommodation with breakfast at 3* hotel in Kathmandu. 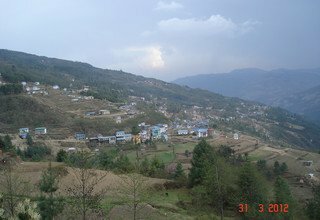 * All teahouse accommodation during the trek. * 1 experienced, helpful and friendly guide, porters(1 porter for 2 persons) if necessary, their food & accommodation, salary, equipments and insurance. * Horse renting and addtional porters used during the trek.